Across Norway, companies are continuously reviewing, assessing and selecting their favored exploration options. Matched and merged regional datasets are essential tools for refining geological knowledge about exploration prospects. KADME, CAMA GeoScience and SXICOM are working together to support this exploration activity with fine-tuned data sets and regional interpretations. The SUPERGRID projects will enhance your exploration activities with smooth and rapid access to integrated 2D/3D seismic and well datasets and high-quality interpretation. Data is a vital resource for the oil and gas industry, particularly when making major licensing decisions. The challenges lie not only in sorting through the huge mass of available data, but also in making it easier to access the right data so that teams can start making important decisions sooner. Our industry-leading experts have extensive experience of the Norwegian Continental Shelf, enabling them to ensure effective data synchronization and high-quality interpretation. SUPERGRID includes velocity models, core sample analysis and special geological/seismic studies to support exploration teams over APA/BR activity. The high value of the end product is guaranteed by extensive 2D/3D seismic data merges and well data setting on the main exploration areas (Barents Sea, Norwegian Sea and North Sea). All of our work is subject to regular and rigorous quality control during the interpretation phase. The datasets are delivered in Petrel and DUG for seismic, well data and velocity models. We can also provide support to ensure rapid seismic data loading. Our aim is to deliver what you need for a ready-to-go project for basin modeling and detailed prospect interpretation and evaluation. Additional services include merging and matching with proprietary seismic datasets and project setup. Picture (left) shows the raw seismic traces from DISKOS incorrectly arranged. Picture (right), shows seismic trace after rearranging. Before (left) and after (right) time and phase matching. Example of a matched 2D line and 3D line (right). Line location is indicated on the map (left, dashed). 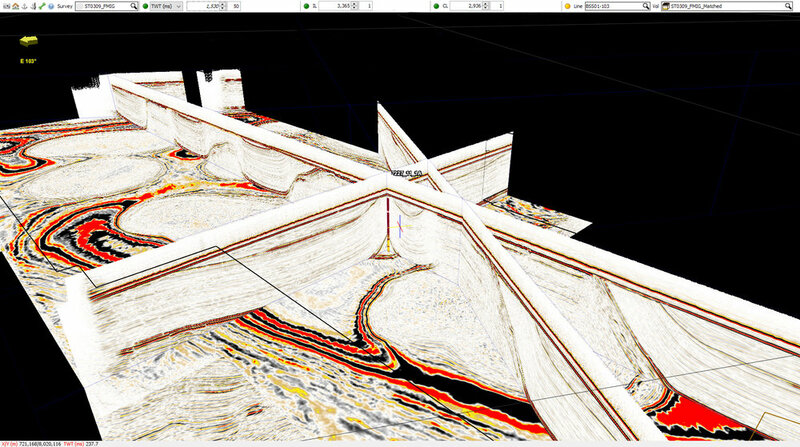 3D view of a 3D survey as it intersects a wellbore. Before processing data is showing spikes (left). After processing the data is harmonized (right). 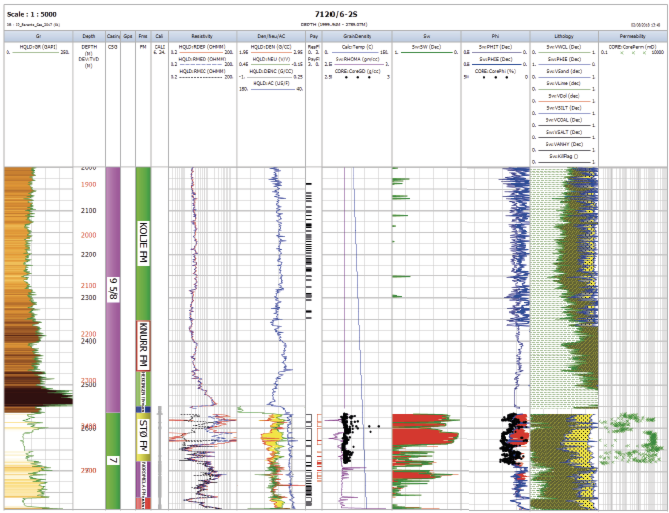 The mineralogy distribution and porosity information are provided per sample in an Excel tabular format. The images of mineral maps come in PNG format and will be organized in directories by well. Well log interpretation and CPI (left). Example analysis from QEMSCAN (right). QEMSCAN mineral maps delivered in bulk (Left). Stacked bar charts of mineralogy (right). Kadme’s data management experts will provide datasets on disk. Updates will be made available online. Synchronised ArcGIS project presenting the location of all delivered seismic, wells, cross sections, etc. Optional delivery of data within KADME's Whereoil software, hosted or on premises, and combined with DISKOS and NPD data.